The sweet and almost candy-like taste of fresh ripe bananas paired with fresh aromatic ripe strawberries! This is a true treat for the senses. A favorite among many of our Vapers. When you add this luscious flavor to your favorite MOD unit, you'll experience a fun and flavorful vaping experience you won't want to put down. 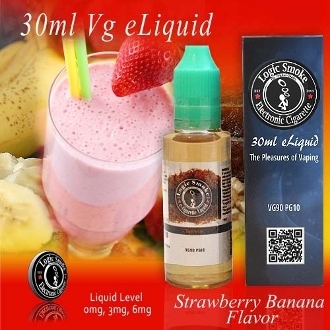 This is a perfect stand alone e-liquid, but be adventurous and mix with a variety of different flavors Logic Smoke has to offer. Add to Cheesecake or Waffle for a yummy pastry adventure. A perfect afternoon "snack" to crush those hunger cravings, without the caloric guilt. Try it today!